Our newest downloads are available as single files containing all you need hosted at Drive Thru RPG, who also carry older releases of RPG and wargaming rules. Additionally, we have individual data cards and other files available in the Older Downloads section, below. This page shows the main download list of files including data cards, errata and FAQs, free add-ons and other material. Dream Pod 9 has a lot of files for download, so it is probably best to use the links below to narrow down your search. Sheet of status tokens, commander tokens, and HGB ruler that can be downloaded and printed without scaling to have correct size on the HGB ruler. A variant of the standard Klemm fielded by the WFPA. We are rolling back our January 2018 Update to the previous Ver 2.0 of the rules after listening to player feedback. This pdf download includes the Changes Log and Utopia Section Ver. 2.1 for the HGB Living Rulebook as our February 2018 Update. Heavy Gear Blitz Peace River and NuCoal Kickstarter for Core Plastic Miniatures. This download is the Pledge Calculator excel sheet updated for the final week, for backers to use to easily calculate their pledge amount to enter in the Kickstarter. It includes all the Reward Levels and Add-Ons available. New 3d PDF of the Peace River Crusader IV model for the upcoming Heavy Gear Blitz 2017 Kickstarter to make plastic miniatures for the Peace River, NuCoal, and Utopia Faction core models. New 3d PDF of the Peace River Skirmisher model for the upcoming Heavy Gear Blitz 2017 Kickstarter to make plastic miniatures for the Peace River, NuCoal, and Utopia Faction core models. New 3d PDF of the Peace River Warrior model Vanguard Variant with Chieftain CMD Upgrade for the upcoming Heavy Gear Blitz 2017 Kickstarter to make plastic miniatures for the Peace River, NuCoal, and Utopia Faction core models. The Peace River Warrior plastic model sprue 3d PDF was made by our 3d Modeler using Solidworks 3d software. You will need to download the file (right click on it) and then open it using Adobe Acrobat reader software, here is a link to the reader software if you don't already have it installed on your computer, tablet or device. New 3d PDF of the Peace River Argos model for the upcoming Heavy Gear Blitz 2017 Kickstarter to make plastic miniatures for the Peace River, NuCoal, and Utopia Faction core models. Excerpt from Heavy Gear Blitz: Locked & Loaded. This can be used independently or with the rules in Perfect Storm, Forged in Fire, or Blood Debt to create Leagueless forces. Pages 75-77 of Black Talon - Return to Cat's Eye show pain schemes for CEF, Caprice, and Black Talon units with detailed step-by-step instructions for painting a Caprician mount. The CEF's massive HHT-90 Overlord.This is a two component vehicle with trial rules in Gear Up 4. Single file containing all datacards from Perfect Storm: NuCoal Field Guide. Heavy Gear Blitz Utopia Armed Forces Kickstarter for Plastic Utopia Faction Core Miniatures. This download is the Pledge Calculator excel sheet for backers to use to easily calculate their pledge amount to enter in the Kickstarter. It includes all the Reward Levels and Add-Ons available. Utopia Section from the Heavy Gear Blitz Living Rulebook with Sample 100 to 160 TV Force page added at the end for the Utopia Kickstarter Models. New 3d PDF of the Utopian Commando Armiger model for the upcoming Heavy Gear Blitz 2017 Kickstarter to make plastic miniatures for the Peace River, NuCoal, and Utopia Faction core models. New 3d PDF of the Utopian Recce Armiger model for the upcoming Heavy Gear Blitz 2017 Kickstarter to make plastic miniatures for the Peace River, NuCoal, and Utopia Faction core models. New 3d PDF of the Utopian Support Armiger model for the upcoming Heavy Gear Blitz 2017 Kickstarter to make plastic miniatures for the Peace River, NuCoal, and Utopia Faction core models. An amazing papercraft Barnaby Gear Transport courtesy Paul Lesack! Great papercraft cargo containers for the Camel transport from Paul Lesack. Wonderful papercraft buildings from Paul Lesack designed to look like shops and garages. Another wonderful papercraft project courtesy Paul Lesack. This one is templates and instructions to build a giant stonehead. John Bell's amazing papercraft Revisionist Church. Paul Lesack's extremely cool papercraft urban buildings for Heavy Gear. This printable sheet is designed so you can cut out the shapes included and fold them around 12mm dice to make your own Blitz dice and damage/effect marker dice. This document has the most up to date errata published for Heavy Gear Blitz. It contains errata for all Blitz related books and Gear Up magazines (issues 1-6). Also in this document are the post 1940 upgrades from Return to Cats Eye and the CEF Heavy Tank Squad updated with the beta tv values. We will be updating this periodically. Here is a flyer saved as a pdf that you can download and print, with information about the Dream Pod 9's War for Terra Nova Kickstarter. We need everyone's help to get the word out about our first Kickstarter. You can help by printing a copy of the flyer and taking in down to your local game store and asking if they can display it while the Kickstarter is running. Thank you all for your support! Optional rules for Duelists and Aces for Heavy Gear Blitz from Perfect Storm. New Heavy Gear Blitz Field Support Guide with updated threat values, rules, errata, combat engineering, medevac and other squad options for the different factions. For use with the Heavy Gear Blitz Field Manual Rules. Heavy Gear Blitz Kickstarter #2 for Plastic Peace River, NuCoal, and Utopia Faction Core Miniatures. This download is the Pledge Calculator excel sheet for backers to use to easily calculate their pledge amount to enter in the Kickstarter. It includes all the Reward Levels and Add-Ons available, and will be updated during the Kickstarter when Stretch Goals are unlocked. The NuCoal Jerboa plastic model sprue 3d PDF was made by our 3d Modeler using Solidworks 3d software. You will need to download the file (right click on it) and then open it using Adobe Acrobat reader software, here is a link to the reader software if you don't already have it installed on your computer, tablet or device. This mpage was omited from a few first-printing small-format Field Manuals. Arena Patrons ready to be cut out and placed in seats! Background decorations for Arena terrain. Sponsor logos to help decorate Arenas. These can also be useful to provide signs and markings for other Heavy Gear terrain projects. Large logos of various Terra Novan companies with white background. Paul Lesack's papercraft communciations tower model. Paul Lesack's great papercraft military structures for Heavy Gear. Texture useful for Arena terrain. Texture to decorate Arena scenery. The Alpha play test Dragonfly and Varis units for addition to the North, South, Peace River, and NuCoal army list documents. These are very alpha at the time of posting. Images for fan sites and similar. 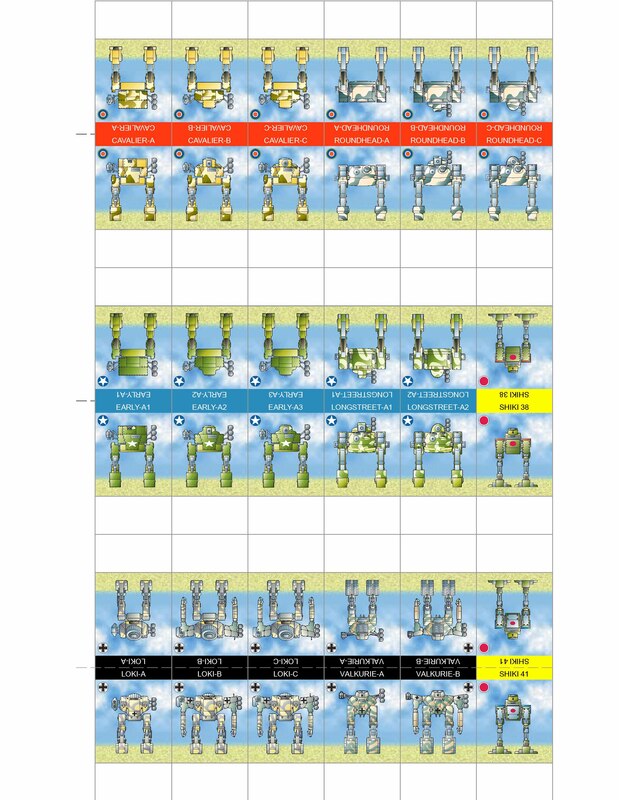 Helpful worksheet for the Heavy Gear RPG/TAC Vehicle Construction System. Heavy Gear Vehicle Construction System used to provide prices and Threat Values for new and variant vehicles for RPG/Tactical scenarios. Special space-modified Black Talon Gear design. CEF Datacards for Frames, Hovertanks, GREL Infantry and more. You are welcome to download the new Jovian Wars: Venus Faction Playtest V1.0 PDF and join in the playtesting of the new Venus Faction for our Jovian Wars Space Battles Tabletop Wargame. A copy of the Jovian Wars Beta Rules is also required to play, and is available as a free download on the DriveThruRPG website, see the link at the top right of this webpage. Short Story entitled The Journey of the Corpse from the Venus Ships of the Fleet book written by Wunji Lau. Free download pdf of the story with its original color artwork from the Venus Ships of the Fleet Book. Jovian Wars Venus Forces Kickstarter Pledge Calculator excel file. Another great Gear Krieg walker papercraft courtesy Jack Bell! Papercraft Cavalier Walker from Jack Bell. Jack Bell's Roundhead Walker papercraft! Papercraft buildings for Gear Krieg from the amazing Paul Lesack! 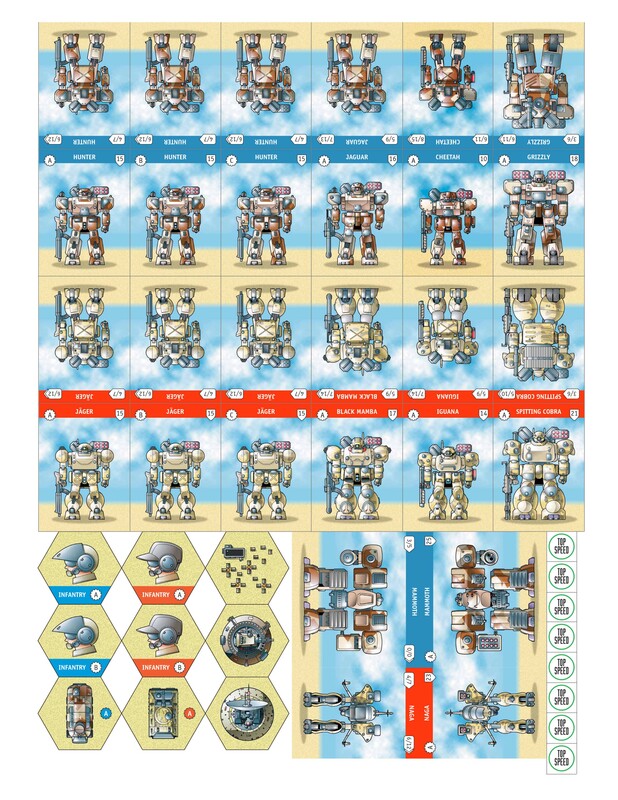 Jack Bell created these weapon add-ons for his papercraft walker models. Jack Bell's Papercraft Longstreet Walker. Jack Bell's Shiki 38 Walker Papercraft. Jack Bell's papercraft German Valkurie Walker! New NPC stats for generic military characters from Paul Lippincott. Maps of key regions in the Tribe 8 setting. Excellent form-fillable character sheet for Tribe 8 from Facundo Argüello. Silhouette Rules character sheet for the Core Command RPG. Core Command character sheet for OGL rules. New 3d PDF of the Peace River Warrior IV model for the upcoming Heavy Gear Blitz 2017 Kickstarter to make plastic miniatures for the Peace River, NuCoal, and Utopia Faction core models. This is an update document for the Heavy Gear Blitz Living Rule book ebook (July 4th 2016). These changes will be in Beta until Spring 2018. Please direct feedback to dmcleod [at] dp9.com and center discussions on these topics in the DP9 forums: HGB development subforum.